Who doesn’t love perfect weather days and cool nights, cozy sweaters and long walks, hot cider and pumpkins in the orchard? We will get in the spirit by decorating the inn. Have you seen the witch collection? If you’re looking for a quick getaway, read on to see what Halloweentime in Newport has to offer…as told by our decorations. Wouldn’t you want to listen to them? Don’t they look like they have (100s of) years of experience? They have you covered for every fun, food, or fear lover. October is meant for apple picking and corn mazes. BUT where is the best? Apple picking at Sweet Berry Farm is one of our favorite fall pastimes. The gorgeous grounds of the farm are a relaxing change of pace from the streets of Newport and the farm shop all the seasonal produce, handmade pies and desserts your tastebuds can imagine. There is unbeatable view of a Newport sunset. This is the place to do your pumpkin picking! Look at all the other things you can do and pick! 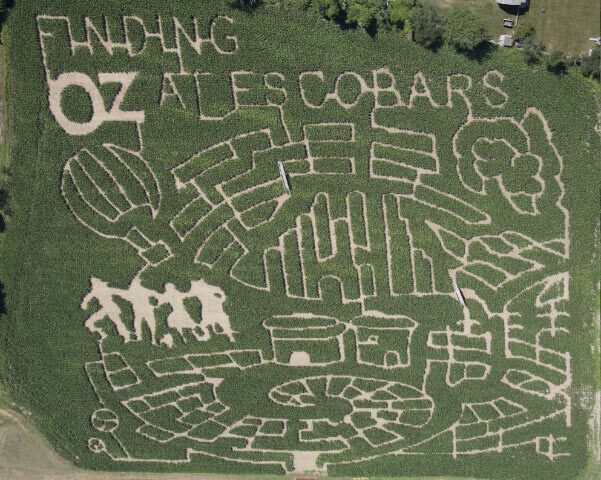 Another fun outdoor excursion can be found at Escobar’s Farm where an 8 acre Corn Maze awaits. It was recently was named among the best in New England. Don’t be fooled by the family-friendly appearance. While kids will enjoy the fun of trekking through the corn trails, even the most directionally savvy travelers will be challenged by this maze! .” The maze at Escobar’s Highland Farm is a Halloween must! There are, fall photo booths, places to decorate pumpkins, hayrides and more! We dare you to dress up in a better costume the scaries at the front desk. Admission is free. The Broadway Street Fair on Saturday, October 6 is basically a stroll along Broadway, Newport’s historic Main Street, to celebrate the diversity that Newport is known for. It begins at Equality Park and extends all along the street offering live music, food, family activities and exhibiting artists. Outdoor stages will feature local musicians, comedy, and dance. More than a dozen restaurants will show off their culinary talents, and local artisans will showcase their creativity, too. All information here! The Food in Newport tastes even better in October. You didn’t hear it from me. 28th Annual Seafood Festival at Bowen’s Wharf will take place on October 13-14. It has been named one of the “10 Fabulous Fall Festivals on the Coast,” this event invites you to enjoy fall on the waterfront. Admission is free and food and drink are available for purchase. This is the perfect chance to taste the best seafood in town. Colorful tents, live music, kids events, and all the fish tacos, lobster rolls, fried calamari, oysters, signature cocktails and cold Whaler’s Brewing beer you can stuff your face with. Do you want to sip, savor and toast to the season? On October 27, you must go to the 2nd Annual Harvest Festival! A fall lover’s dream: grape stomping, wine tasting, and pie eating. This is the magic of fall in one festival! $25 per person, which includes wine tasting. Are you competitive? Try the grape stomping and pie eating contests! More info here! If you like to be spooked this time of year, come to Newport! There is so much history here there is bound to be something haunted. Guided Ghost Tours, offered Thursdays through Mondays, take you through streets and alleys guided by lantern and some spooky stories of what’s lurking around our seaside town. Even scarier is Fort Adams’ Fortress of Nightmares where visitors 12 and up are welcomed to roam “tunnels of terror” in the historic Newport landmark. Ghost hunts are offered after 10pm. Check out the biggest and best costume party in Newport. The 3rd annual Halloween CarnEvil on Friday, October 26; 7:00 – 11:00 PM contains circus performers, Creepy Cocktail Hour, a fortune teller machine, and excellent people watching to see who has the best costumes. Bonus: not into fear, fun, or food? Try something FAST. Get on your brooms and start practicing for the iconic 4 mile Pell Bridge Run. This is on a lot of people’s bucket lists. The eighth annual Citizens Bank Pell Bridge Run will be held on Sunday, October 21, 2018 at 7:00 a.m. Once a year pedestrians are allowed to run or walk across the Claiborne Pell Bridge from Jamestown to Newport, R.I. The race starts in Jamestown and ends in Downtown Newport. All proceeds from this event are donated to local charities. You have until October 21 to get in shape for this one a year event. Do you want FOOD, FEAR, AND FUN? Take a seat to hear all about the October special. Our special is for you. You much check out “Dinner With a Side of Ghost Package!” We treat you to two nights at the inn with a bountiful continental breakfast buffet each morning, a gift certificate towards dinner on the town, a Ghost Tour, and a special Halloween surprise. With your two tickets to Ghost Tours of Newport, you take a lantern-led evening stroll down historic Newport’s shadowy paths and discover the legendary ghost and ghouls of our haunted city. If you’re not entirely spooked out when you’re done, use your $50 dinner gift certificate! 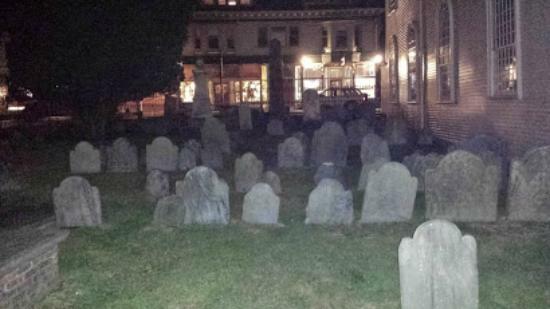 These ghost tours are Nightly through October. Call to claim before the crow steals it! Many New Englanders will tell you that fall is their favorite season. From beautiful foliage to crisp weather to great outdoor activities to spooky Halloween fun, there’s plenty to love about autumn, especially in Newport! What is your favorite thing to do in October? How early do you put up your Halloween decorations? What are your traditions you can’t wait to continue this year?